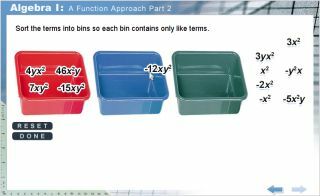 The American Education Corporation has announced that it has released Algebra I: A Function Approach Part 2, a new interactive high school course for the A+nyWhere Learning System courseware program. The program is designed to provide students with interactive approaches to solving algebra problems using real-world examples and scenarios. Each of the thirty-seven lessons contains a study guide, practice exercises, and a mastery test. A fully functional virtual graphing calculator designed specifically for this course is included.